The QS Series USB interface module lets you connect your device to a USB port. Use it to set up communication between a PC and a serial device such as a microcontroller, Linx RF module or legacy peripheral that has no native USB port. Rapidly develop hardware and software based on the QS Series USB interface module with the QS Series master development system. It comes with a development board for testing and prototyping that is populated with a USB interface for connecting to a PC. A large prototyping area gives you a place to develop circuitry. To help you get started, the system also includes an extra module and demonstration software. The QS Series USB interface module lets you connect your device to a USB port. 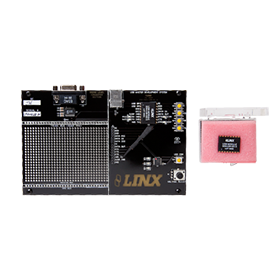 Use it to set up communication between a PC and a serial device such as a microcontroller, Linx RF module or legacy peripheral that has no native USB port. The latest software included in the QS Series master development system. Demonstrates the use and functionality of the QS Series USB module. The QS Series USB module can be programmed to display a custom name, description, and manufacturer ID as well as a unique serial number so that it can be distinguished from other modules on the same bus. The QS Series programmer is an executable that can program this information to the module's onboard EEPROM through the USB bus. This file contains the Visual Basic source code for a program that will send a string of characters to the QS Series USB module and read it back. This program requires that the DATA_IN and DATA_OUT lines on the module be connected together. The software makes use of the direct drivers and shows how to use the functions in a simple routine.